Teletalk Agami 3G SIM online Registration proccess 2017 started ! 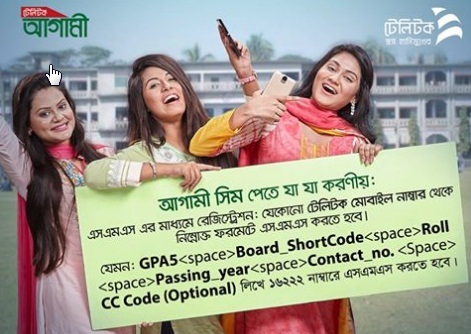 Download User Registration form at agami.teletalk.com.bd and Complete Agami sim registration by sending sms to 16222 from teletalk Mobile Number. CC Code, Online Registration Form , SMS Method and all Necessary information and instruction available at bdeducationinfo.com . Agami Sim Registration start from 15 June 2017. All GPA-5 holder SSC Student of 2012,2013,2014,2015,2016 & 2017 are eligible for Teletalk SIM offer 2017. You have to Apply before 30 September 2017. Teletalk Agami SIM registration is on going. It will be continue up to 31 July 2017. Only SSC GPA-5 students will get this Agami SIM. Bellow this post you have to see the details registration process and Agami SIM call rate including internet package price and activation code. You may visit more information www agami teletalk com bd. – The Agami SIM will be distributed to GPA5 holders at SSC level. eligible for Agami SIM registration. Agami SIM previously) is also eligible for Agami SIM registration. – The student is not allowed for Agami SIM who has already received earlier. – SIM can be collected from his/her Chosen Customer Care after getting SMS from Teletalk. – Complete Agami SMS registration by sending an SMS to 16222 from Teletalk Mobile number. 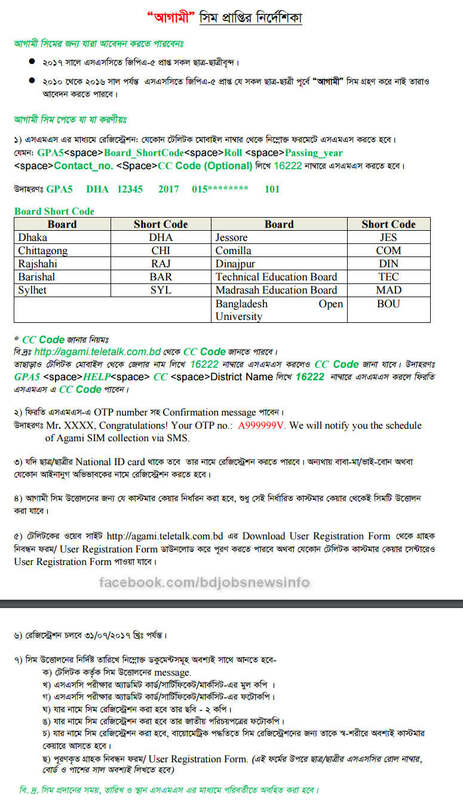 • Original SSC Admit Card/ Mark sheet/ Certificate. • Photocopy of SSC Admit Card/ Mark sheet/ Certificate. directly from any Teletalk Customer Care Center/ Point. N. B: The date of SIM collection will be notified via SMS, TBL Website (www.teletalk.com.bd) and Teletalk facebook Page. You can also Get updates about this offer https://facebook.com/bdjobsnewsinfo . To avail a data package, the user need to write desired short code and send to 111. To set FnF number: Dial 1515 and follow the next direction or write Reg in message option and send it to 363. To add FnF : After getting a confirmation SMS to add a FnF number – Write Add in message option then put a space then write the desired FnF number and send to 363. To set every FnF number you have to send individual message by following the same procedure but have to register only once.It will be activated within 72 hours. To Delete FnF: Write del in message option then put a space then write the desired FnF number and send to 363. To Check FnF: Write see in message option and send to 363. Change FnF: Dial 1515 and follow the next direction. To Migrate to Ekush, Write “21” and send SMS to 555. To Migrate to Bijoy, Write “bij” and send SMS to 555. To Migrate to Shadheen, Write “sha” and send SMS to 555. Hope You get Teletalk Agami Registration instruction from bdeducationinfo.com . For more information about Teletalk SIM offer 2017, Student Teletalk Sim offer, agami sim , Bornomala sim offer , SIM Collection Date , teletalk student sim News etc Stay visit this website. This entry was posted in Education Services, Scholarship and tagged teletalk sim offer by admin. Bookmark the permalink.